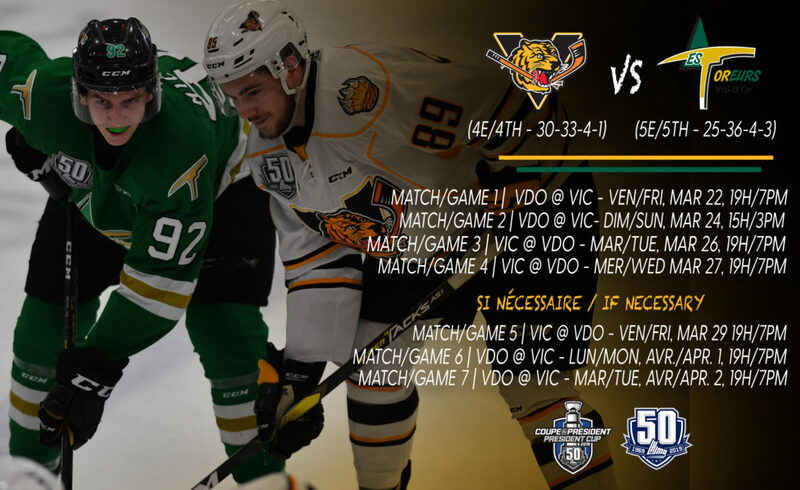 With less than ten points separating the two teams in the regular season’s standings, the Victoriaville Tigres and Val d’Or Foreurs will prepare to clash in the postseason starting on Friday night at the Colisée Desjardins. The Tigres, a team that relied heavily on youth, particularly on offense, finished fourth in the Western Conference with a record of 30-33-4-1, good for 65 points. The Foreurs, another young team with no less than 11 first or second-year players in its fold, ended the regular season with a 25-36-4-3 record, 57 points and a fifth-place finish in the West. 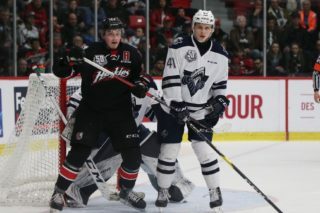 The Tigres entered this season fresh off a lengthy playoff run in 2018 that saw them eliminate first the Gatineau Olympiques, then the Drummondville Voltigeurs, both in five games. 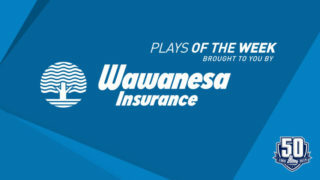 They were halted by the Acadie-Bathurst Titan in four straight games during the league Semi-Finals. This is the 15th consecutive season in which the Tigres have qualified for postseason play. 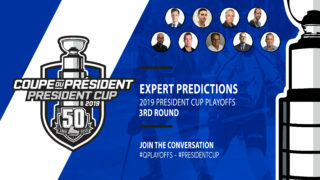 The have previously clinched berths in the President Cup Final in 1989, 1990 and 2002, winning the title during the last attempt in a six-game series with Acadie-Bathurst. 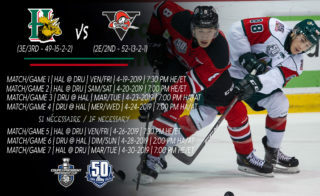 The Foreurs have appeared in the President Cup Playoffs in each of the past ten years. 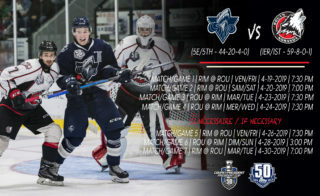 Last year saw them fall in four straight games at the hands of the Jean-Rougeau Trophy Champion Blainville-Boisbriand Armada in round one. Val d’Or has a decorated history of play in the QMJHL postseason, reaching the league final on four occasions and winning the President Cup three times (1998, 2001, 2014). Their last series win occurred in 2017, when they eliminated the Shawinigan Cataractes four games to two in a first-round encounter. The Foreurs are one of just two lower ranked teams in the first round of this year’s playoffs to win the season series over their opponent. Val d’Or took three of their four meetings over the Tigres, the most recent victory coming on February 7th, when Jeremy Michel’s goal at the 45-second mark of overtime earned his club a 4-3 win in Victoriaville. The Tigres’ only triumph over the Foreurs came all the way back on September 28th at home, a 3-1 come-from-behind triumph punctuated by a pair of goals from Simon Lafrance. Lafrance led the Tigres in goals during the regular season with 29. His 55 points placed him second on the team in that department. The other top scorers on the club were a pair of dynamic first-year players from Europe, Russians Egor Serdyuk and Mikhail Abramov, who finished first and tied for second in the league in rookie scoring with 65 and 54 points, respectively. 20-year-old defenseman Dominic Cormier led the charge from the blueline with 44 points, while goaltender Tristan Côté-Cazenave won 20 games, finishing fourth in the “Q” in GAA (2.48) and second in save percentage (.920%). Despite a wealth of younger talent, the Foreurs were led by a trio of veterans in center Julien Tessier (64 points), defenseman Felix Boivin (54 points) and Nicolas Ouellet (45 points in 55 games). Boivin’s totals were good for sixth in the league’s scoring race among defensemen. In nets, Jonathan Lemieux won 19 games while coming up particularly big down the stretch, going 9-2-0-1 over the final six weeks of the regular season and allowing the Foreurs to distance themselves from sixth place Blainville-Boisbriand and seventh place Gatineau in the standings. Curiously, despite a combined 41 playoff appearances between the two clubs over the last 23 seasons and spending considerable time playing within the same conference, this is only the second time the Tigres and Foreurs will have faced off in the postseason. 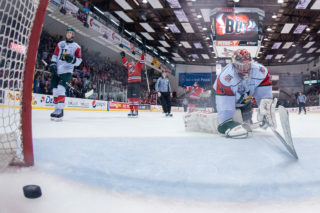 The only previous matchup took place during the 2001 QMJHL Semi-Finals, when the Foreurs, led by superstars Simon Gamache and Brandon Reid, defeated Marc-André Thinel, Antoine Vermette and the rest of the Tigres in a seven-game thriller. Interestingly, a couple of noteworthy historical sidebars to this series revolve around the non-playing personnel of both squads. Tigres Assistant Coach Carl Mallette was one of the Victoriaville players involved in the aforementioned 2001 showdown between these two teams, racking up an impressive 12 points in that seven-game series. Meanwhile, Foreurs’ Assistant General Manager and Video Coach Yannick Dubé spent three seasons in Victoriaville as a player with the Tigres, including the 2011-12 campaign when he scored 36 goals and 72 points for the franchise he’s about to face in round one.